Episode 51: Should You Tie Your Own Flies? Tie your own flies? Some might say you can’t be a real fly fisher unless you do. Well, we differ on the matter. Steve ties his own, and Dave doesn’t. In this episode, using a point-counterpoint approach, we discuss the age-old question of whether you should tie your own flies. Listen to Episode 51: Should You Tie Your Own Flies? Do you tie your own flies? If so, do you ever buy flies? If not, why not? 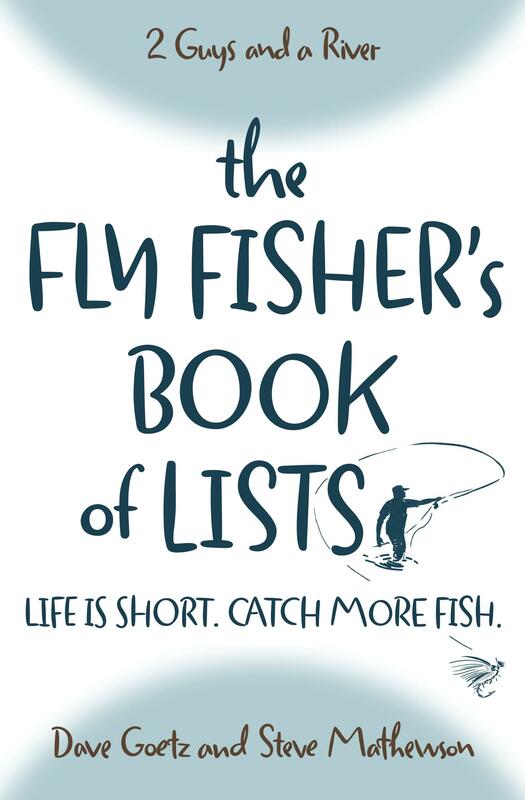 The majority of flyfishers don’t tie their own flies. Most guides tie their own to use when guiding and some tie commercially. Flyfishing and tying flies are two very different skills. I know tyer’s who don’t fish. The initial cost can be expensive. Like flyfishing, there is always something to spend money on. If you learn a few basic tying skills, you can tie most of the flies you will use. It is a never-ending investment. It will eventually cut the cost of a fly down to pennies rather than dollars. The single most expensive material cost you will have is in feathers. Expensive but worth the cost if using Whiting or Hoffman feathers. Another stage, should you want, is dyeing your own feathers. If you are to be really good at anything, you must develop a passion. Good point. After the start-up costs, every fly you tie gets cheaper. My brother-in-law used to be in the printing business, and he said the same thing about the stuff he printed for the Texas Rangers baseball team. The first game day program costs $2000.00, then the rest are about a penny apiece! Hi Guys! Just finished listening to your conversation about whether or not to tie your own flies or not. I learned and have tied my own flies for over 20 years now, and love every minute of it. (Obviously, I would fall on Steve’s side of tying your own. ) However, (in my opinion) one thing that Steve did not talk about that would favor tying your own flying is the simple fact that it is incredibly fun and satisfying to view and successfully use your finished product. In my ‘personal’ opinion, I like to think that many of my flies are much better in appearance and quality than some you can buy. I find great satisfaction and fulfillment in the whole process. If I were to make my decision to tie flies based on the start up and ongoing cost, then I would probably not begin any kind of recreational hobby. It most always has to be because it is something you enjoy and find fulfillment in. Blessings on your podcast “ministry.” Will either of you be at CCR this summer? Thanks, Arlen! Always good to hear from you. No, I don’t think we’re going to make it to CCR. I wish we were. You and I are a good example of two different kinds of fly tyers. You have amazing artistic ability (Arlen does some amazing bronze sculptures), and I have have next to none. Still, I enjoy the accomplishment of fly tying, even though it takes me longer than you to tie just about any pattern!! One of the reasons I tie flies is that it allows me to continue to be “involved” in fly fishing during the off season. Here in Minnesota in the dead of winter when it is -30, there is 3 feet of snow on the ground and all the open water in the state has been frozen solid for months, it is nice to be able to sit down at the vice and prepare for the thaw that will come (someday). I actually started tying just about eight months ago. So, let me share something that helped me. I found a really good Youtube series that I liked. This series of videos started by showing some of the tools, then moved on to show you how to do a couple key skills (i.e., how to do a whip finish), and then had instruction on about a dozen different fly patterns. The good thing about this series was the patterns tended to build on the skills you learned in the last pattern. Like you said in your podcast, some people might need actually instruction, this however worked for me. As I watched the first couple patterns, I made a list of materials that were being used so that I could create a “recipe” for the flies and so that I could compile a shopping list for my first big purchase. Thanks, Daniel, for a helpful comment. Yes, tying does help pass those long winter days and gives a preview of what is to come in the spring. What series of You Tube videos did you use? There are some really helpful ones on the web. That’s cool that you learned to tie solely by watching videos on the web. Here’s one more thought. Because I tie my own flies I am much more likely to make that risky cast under the overhanging branch. For me, it’s the difference between a couple of bucks vs. a few cents for the fly I tied. Sure I lose a few, but I’ll make the cast with no fear and sometimes there is a great fish laying there. Great point! I’ve felt the same way … except for some elk hair caddis flies I tied which took me longer than they should have. It was harder to lose one of them after all the extra effort it took to tie them (haha! ).